Get your taste buds dancing! There’s just a week or two left to taste the 2012 crop of SweeTango apples, so keep your eyes peeled. 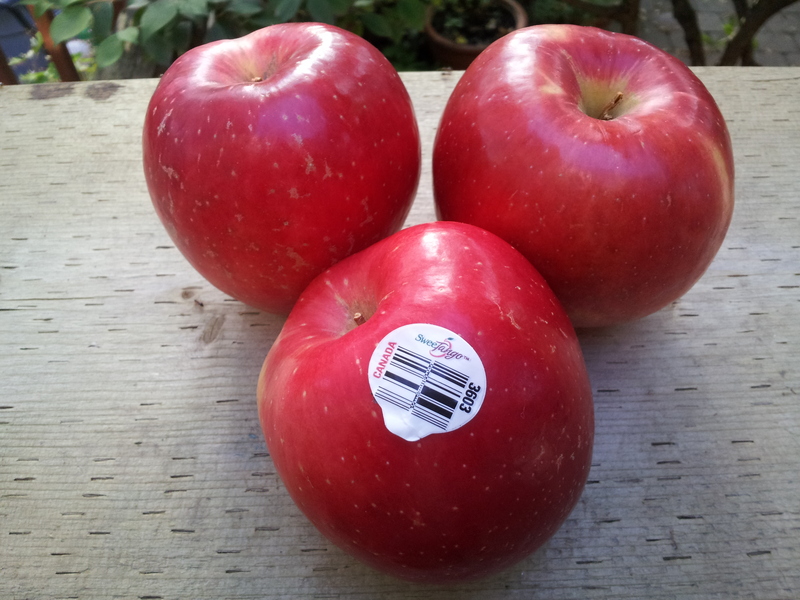 This freckled red beauty with the snap-happy crunch and sweet-tart flavour, released in 2009 after more than 20 years of research and trials, is a cross between the now colossally famous Honeycrisp and Zestar!, another treat from University of Minnesota apple breeders. SweeTango is harvested in late August and early September, so it’s around for only a few months. Quantities are limited, but we’ll be seeing more as the trees mature over the next few years. In Canada, Quebec and Nova Scotia growers are licensed to grow this “club” variety, along with growers in five U.S. states including Michigan and Washington. As the experts explain, SweeTango and Honeycrisp have much larger cells than other apples, so when you bite into them the cells shatter and release their sweet juice. I found SweeTango at Loblaws and Longo’s. Will the new kid on the block usurp its famous mom? You be the judge.